The Registered Nurses’ Association of Ontario (RNAO) has again certified Niagara Health as a Best Practice Spotlight Organization (BPSO) for the next two years. Niagara Health has been a BPSO since 2003. The designation is awarded to organizations that make a positive impact on patient care though implementation of evidence-based practice and guidelines. This designation is renewed every two years, based on strict criteria. The RNAO creates best practice guidelines, based on the latest research and data available. BSPOs access those guidelines, identifying where their own practices can be improved upon by adopting care practices outlined in those guidelines. For example, Niagara Health nursing staff started using insulin pens for diabetic inpatients based on evidence indicating that patients have better outcomes and better experiences with pens instead of the traditional needles. Niagara Health nurses have raised standard of care for diabetic patients. In keeping with RNAO BPSO designation, Niagara Health will develop a Best Practice Guideline champion network. The Welland Site of Niagara Health is hosting a workshop conducted by the RNAO to that end today, with 60 delegates from across Niagara Region. Niagara Health is also energizing staff and supporting them through learning, so they understand the evidence and make the link to the work they do every day. “It is important to provide educational opportunities for our staff across teams and departments, so they can identify new ways to improve care, then empower them at the local level and watch them succeed,” Johnston said. 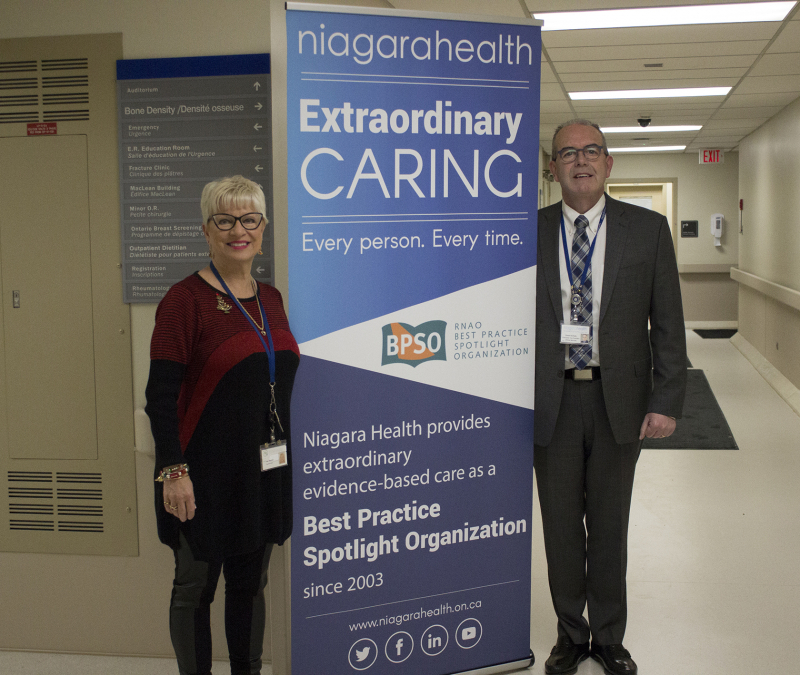 Niagara Health is committed to maintaining its BPSO designation by focusing on engaging nurses and other health professionals within the organization to adopt and sustain an evidence-based culture. The implementation the RNAO’s best practice guidelines raises the professional profile of nursing at Niagara Health and contributes to the provision of safe, quality care for our patients and families.